A few years ago we went to Penn State to watch a football game. 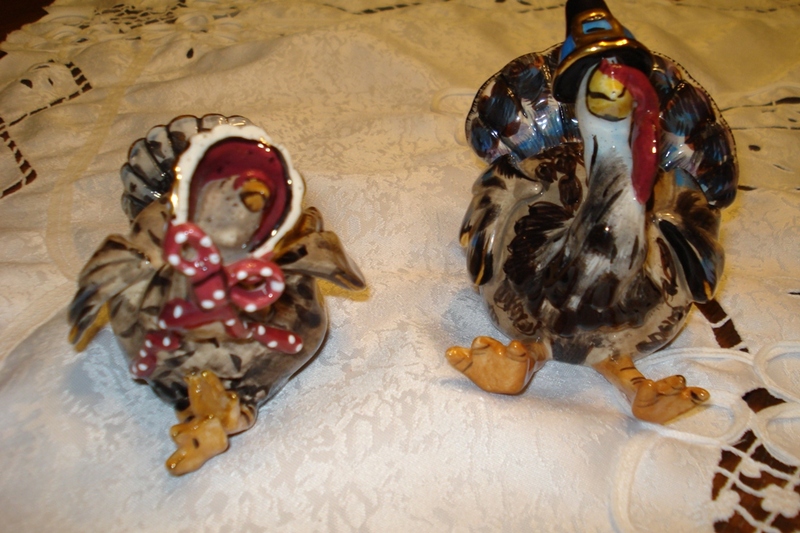 I collect salt and pepper shakers and we bought this cute turkey salt and pepper set while we explored the town. They are special and I put them out for both the Canadian and American Thanksgiving. 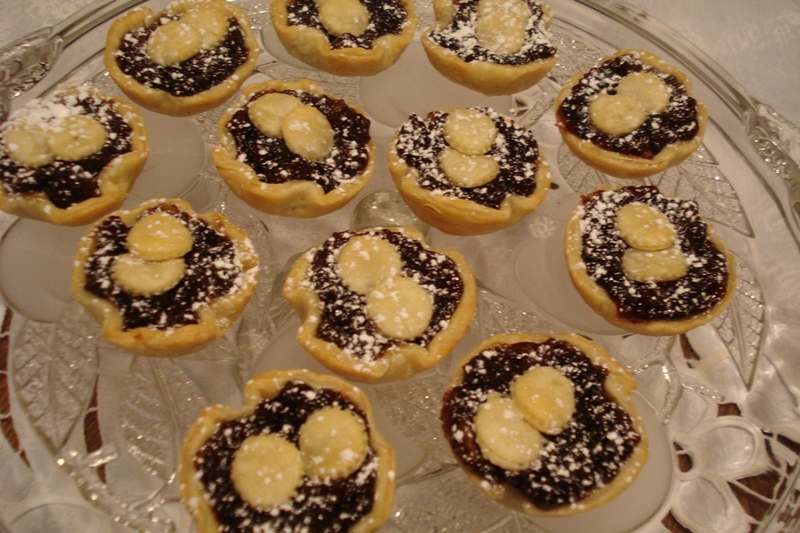 Last night I made some mincemeat tartlettes because the Love Bunny loves them for Thanksgiving. They are little and bite size and he’ll be a happy boy when he samples them. We’ll warm them up a bit and mmmm yummmy. Today I am off at noon until Monday and he will be arriving right around the time I get home. 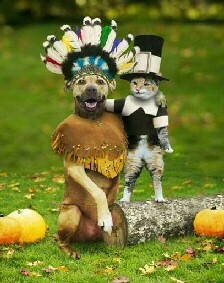 We are invited to our very close friends’ place for dinner on Friday to celebrate the American Thanksgiving. It has become a lovely tradition for the 4 of us to celebrate taking turns hosting. I wish for my my dear blogging friends to have a very Happy Thanksgiving with your family and friends. There is truly so much to be thankful for. 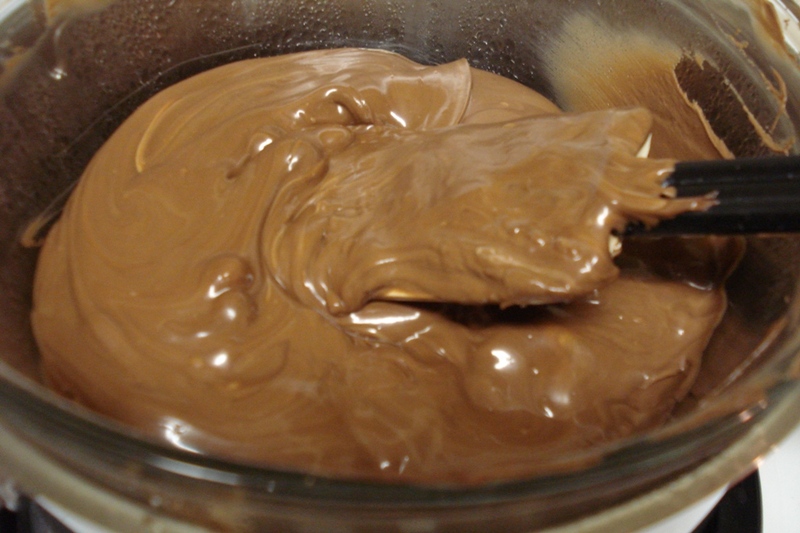 Over a double boiler I melted the chocolate stirring frequently. 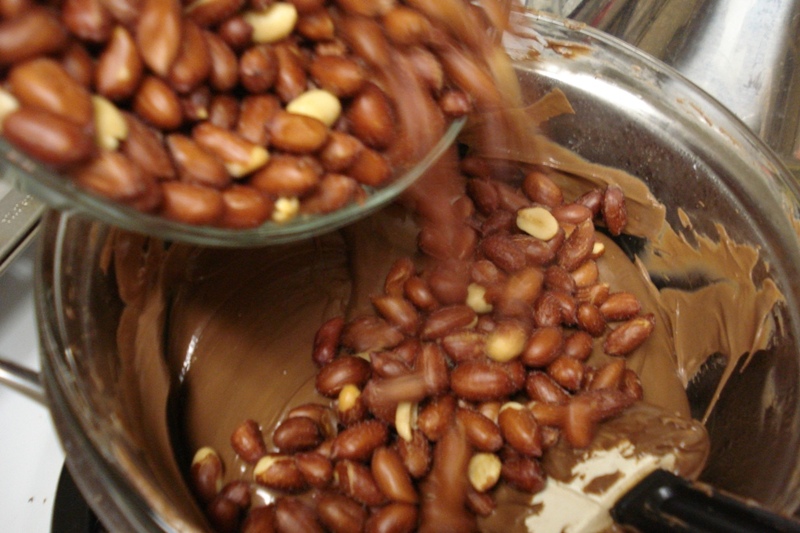 I poured in the nuts and mixed them well. 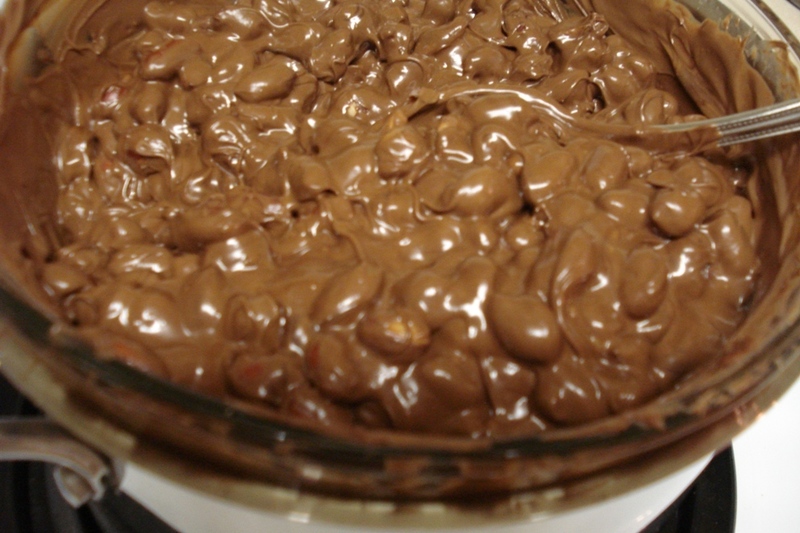 Can’t you just taste how good a spoonful of this would be??? Then on to a baking sheet with waxed paper and they are done. They are soooo yummy. I’ve slipped them into a tin and into the freezer out of temptation’s way, although I discovered tonight they sure are yummy when they’re nice and frozen cold..mmmmmm.. 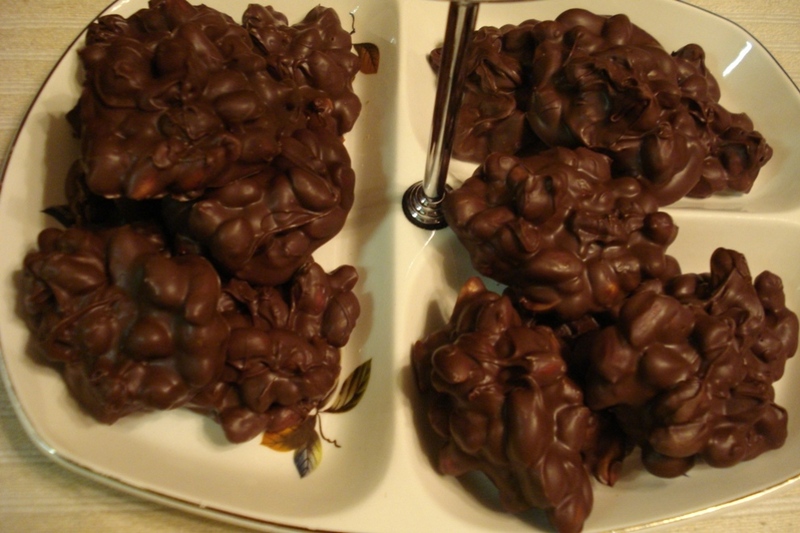 These Chocolate Clusters are ideal for making ahead and just take them out of the freezer to share with family and friends. Thats one quick and easy yummy! I have the winner for the celebration of 1000 comments and another giveaway. My last comment received was #991 last night. Today I chose the first 9 comments (to add up to 1000 comments) of friends who wanted to participate and I’d asked those people to then leave their email addresses. I was really confused because some people didn’t mention the giveaway…..so I guess they didn’t want to participate? *sigh*. Sooooo the 1st post of someone who wanted to participate was by Darlene and and the last and 9th post was from Dawn. 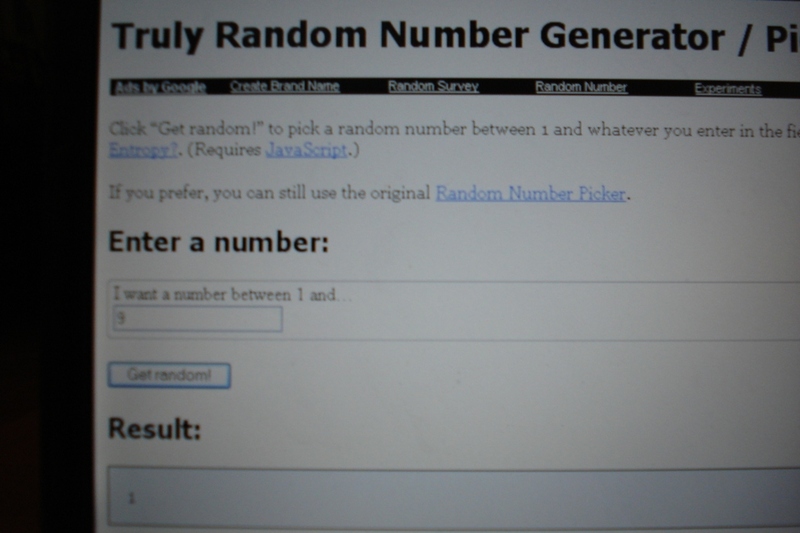 I used the Random Generator and entered the numbers 1-9 and the number appeared….ta daaaaaaaaaaa #1!! Darlene from DarleneDays was the winner! I was so pleased that Darlene won because she so diligently comes along and reads and leaves me comments. In return I really enjoy visiting her blog mostly every day and share my comments. She is a new mommy to a stray kitty and she’s likely too busy getting that kitty down her indoor Christmas tree, she may not even realize she is a winner. I’m sending some goodies I’ve made: a colourful striped tote bag, a yummy Sleigh Ride glycerin soap, a fizzing bath bomb, Lemon Blossom moisture lotion bar, and an Inspirational Key tag. 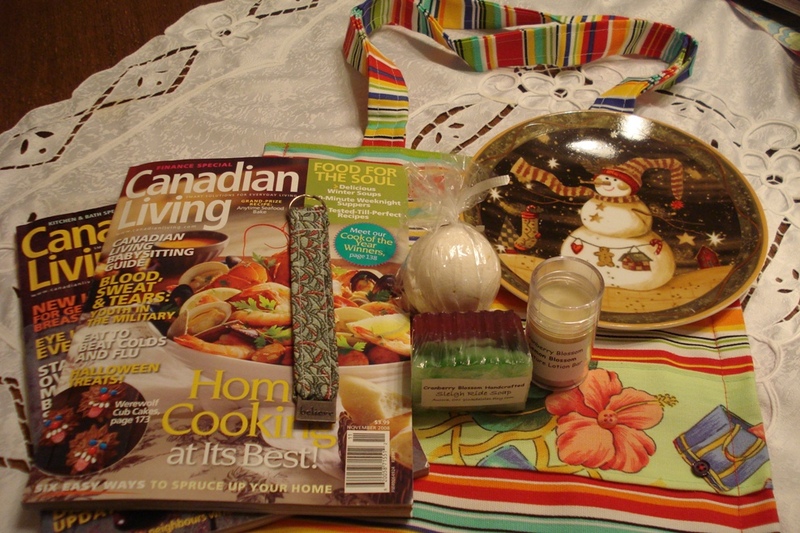 Then I’ve added a Christmas plate and a couple of Canadian Living magazines (just love that magazine – so I like to share it). I hope she’ll enjoy them. I wish I could send something special to all my lovely blogging friends for you make my day and you make me feel happy…or sad….or scared…or whatever when I read your blogs. As Dawn commented “after a while you almost forget that you have never met some of the ladies that you chat with every day”. That is so true. Thank you for visiting and thank you for your comments. BLUE Monday & Another Giveaway!! Funny how you can determine the day by its colour on blogland…today being BLUE Monday hosted by Sally from SmilingSally. Thank you Sally!! Be sure to click on her blog name to take you to her site where you can see all the other Blue Monday participants. You’ll see and read about all kinds of lovely BLUE. Today I am going to share with you my little Cherished Bunnies. I have a little bunny collection. I even have a BIG bunny who I call my Love Bunny too! But these are my little bunnies. 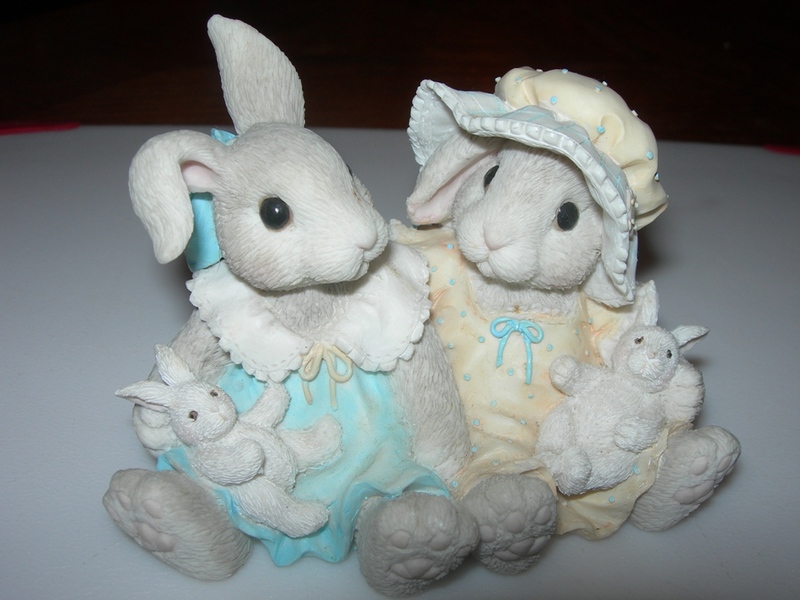 Aren’t these little girlfriend bunnies cute wearing a lovely BLUE dress, cuddling their cherished little baby bunnies? I love the little bonnet with the blue dots that remind me of icing on a wedding cake. 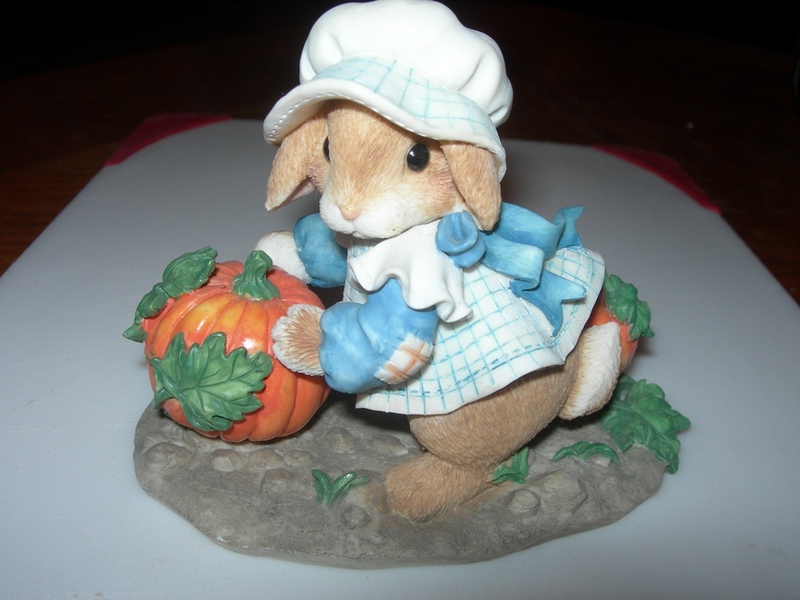 This little BLUE dressed bunny is getting ready to make some pumpkin pie for Thanksgiving I think. I’ll share some more another day. I hope you’ve liked looking at my BLUE Monday bunnies. Be sure to head over to Sally’s. I had a Giveaway recently for my BIG 200th post! Where had the words gone…where had they come from? What inspired them I wondered? It didn’t take me a minute to figure out it was because of my wonderful blogging friends…those Girls in My Circle. That circle that grows as we venture further into each other’s blogs. Without you and your lovely comments I would have thought I was just writing to myself! So goodness THANK YOU leaving your comments! In Celebration of your comments I got to thinking about something. So I am having another giveaway and its going to happen when? Might be today…only my readers will influence that. Because this giveaway came so quickly I can only say that it no doubt will be some goodies I’ve made. So ladies this is a very quick giveaway. The winner will happen soon as I said. IF YOU WOULD LIKE TO PARTICIPATE PLEASE LEAVE ME A MESSAGE WITH YOUR EMAIL ADDRESS USING THE “AT” AND “DOT” so I can contact you. Good Luck! Just a note to let you know we are hoping to see you Thanksgiving Day. But…. Our sidewalk will not be lined with homemade, paper bag luminaries. After a trial run, it was decided that no matter how cleverly done, rows of flaming lunch sacks do not have the desired welcoming effect. Once inside, our guests will note that the entry hall is not decorated with the swags of Indian corn and fall foliage I had planned to make. Instead, I’ve gotten the kids involved in the decorating by having them track in colorful autumn leaves from the front yard. The mud was their idea. The dining table will not be covered with expensive linens, fancy china, or crystal goblets. If possible, we will use dishes that match and everyone will get a fork. Since this IS Thanksgiving, we will refrain from using the plastic Peter Rabbit plate and the Santa napkins from last Christmas. Our centerpiece will not be the tower of fresh fruit and flowers that I promised. Instead we will be displaying a hedgehog-like decoration hand-crafted from the finest construction paper. The artist assures me it is a turkey. We will be dining fashionably late. The children will entertain you while you wait. I’m sure they will be happy to share every choice comment I have made regarding Thanksgiving, pilgrims and the turkey hotline. Please remember that most of these comments were made at 5:00 a.m. upon discovering that the turkey was still hard enough to cut diamonds. As accompaniment to the children’s recital, I will play a recording of tribal drumming. If the children should mention that I don’t own a recording of tribal drumming, or that tribal drumming sounds suspiciously like a frozen turkey in a clothes dryer, ignore them. They are lying. We toyed with the idea of ringing a dainty silver bell to announce the start of our feast. In the end, we chose to keep our traditional method. We’ve also decided against a formal seating arrangement. When the smoke alarm sounds, please gather around the table and sit where you like. In the spirit of harmony, we will ask the children to sit at a separate table. In a separate room. Next door. Now, I know you have all seen pictures of one person carving a turkey in front of a crowd of appreciative onlookers. This will not be happening at our dinner. For safety reasons, the turkey will be carved in a private ceremony. I stress “private” meaning: Do not, under any circumstances, enter the kitchen to laugh at me. Do not send small, unsuspecting children to check on my progress. I have an electric knife. The turkey is unarmed. It stands to reason that I will eventually win. When I do, we will eat. I would like to take this opportunity to remind my young diners that “passing the rolls” is not a football play. Nor is it a request to bean your sister in the head with warm tasty bread. Oh, and one reminder for the adults: For the duration of the meal, and especially while in the presence of young diners, we will refer to the giblet gravy by its lesser-known name: Cheese Sauce. If a young diner questions you regarding the origins or type of Cheese Sauce, plead ignorance. Cheese Sauce stains. Before I forget, there is one last change. Instead of offering a choice between 12 different scrumptious desserts, we will be serving the traditional pumpkin pie, garnished with whipped cream and small fingerprints. You will still have a choice; take it or leave it. I hope you aren’t too disappointed that Martha Stewart will not be dining with us this Thanksgiving. She probably won’t come next year either. Tea-for-One Sets ….. for the birds? Good Morning…its Pink Saturday again! Beverly from HowSweettheSound is hosting Pink Saturday where you can click and travel throughout her Saturday post to participants who are showing and taking about all the loveliness of PINKS. Be sure to visit her blog and leave a comment on the PINK blogs you visit so they will know you’ve been there. That makes it more fun too! Those of you who have read my blog since the summer know that I love to take Tea-for-One (teapot and cup sets) and transform them. 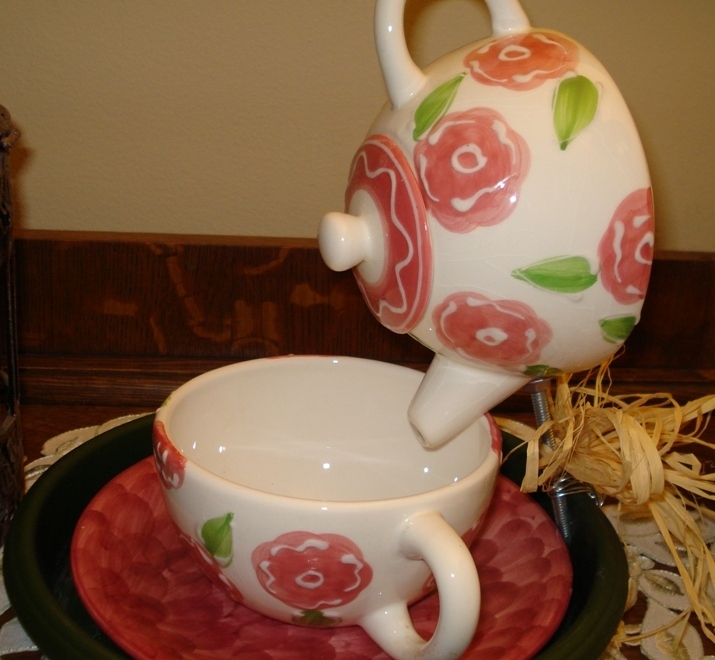 I like to make them into a Teapot Garden Party for the Birds such as this PINK one. Cute isn’t it? I have made about 18 of them. They have all sold except for 4 that I’ve kept or given away as gifts. I just look at these little Tea-for-One sets in a different way these days. There are so many different colours and styles available. 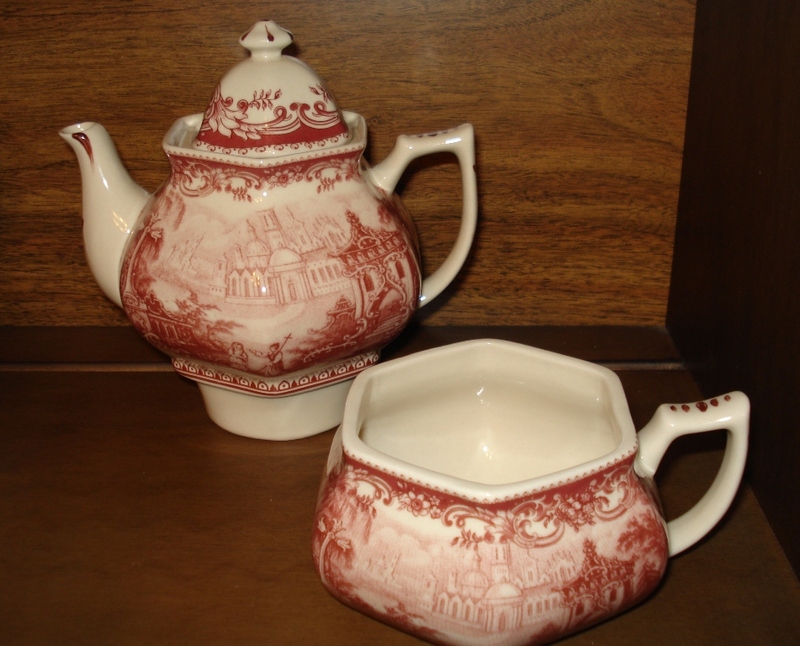 Well this fall I found and purchased this French Toile, red and white transferware Tea-for-One set with the intention of making it into the same type of bird feeder which would involve drilling and bolting the pretty little one. When I got it home I just couldn’t do any alterations to it. It sits in my hutch where I can admire it just the way it is. Pretty? I do have to admit it was called a red and white transferware but there is such a soft PINK hue to the colour. I am passing it through for you to admire the PINK in it. You know how some weeks seem to fly by quickly and others just crawl even if you are busy with things. Sometimes you lose track and sometimes it just feels like its a certain day but oh my gosh its really “only” or oh my gosh its Thursday already!!! Yikes.. I could picture this scenerio and wanted to share it with you. There was a young lady who was totally exhausted from a week’s worth of work. Finally, it was time for her to end her work day and go home. As she entered the elevator, she sighed a triumphant, “T-G-I-F…,” and began to relish the thought of going home and relaxing the weekend away. It so happened that there was a man on the elevator with her and heard her jubilant exclamation. Now the woman was not sure if she heard the man correctly and she was determined not to let this man ruin her beautiful weekend she had ahead of her, so again she stated more strongly, “T-G-I-F!” and glared at the man, daring him to repeat his obscenity. And with that walked off the elevator with a spunky step.